Huka Lodge in Taupo, New Zealand. Ranked #42 in our countdown of the 100 Best Hotels and Resorts in the World. 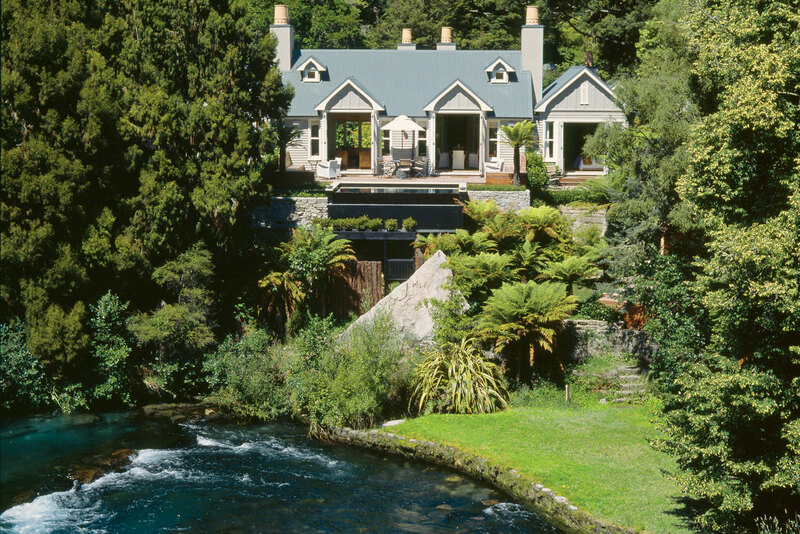 Patrician good looks, history and a perfect position overlooking the jade-green waters of Waikato River. The lodge’s original raison d’être was fly-fishing. This remains a lure for guests but there are other options – horse riding, golf, white-water rafting, heli tours, or perhaps a genteel game of pétanque on the lawns. Inside, everything is well-mannered style, with wingback chairs, tartan throws, gilded paintings and a snug little library. You couldn’t be more comfortable in the guest suites; all soft neutrals, luxury linens and decks with dreamy river views. Guests converge in front of the roaring fires for a tipple before retiring to a romantic dinner of New Zealand’s finest produce and wines. Did you know In the 1920s, news of fly-fishing at the lodge spread and attracted famous anglers such as HM Queen Elizabeth, the Queen Mother.